Audofleda was a Gothic queen. She was the sister of Clovis I, King of the Franks. She married Theoderic the Great, King of the Ostrogoths (471–526), around 493 AD (exact date unknown). Theoderic sent an embassy to Clovis to request the marriage. This political move allied Theoderic with the Franks, and by marrying his daughters off to the kings of the Burgundians, the Vandals, and the Visigoths, he allied himself with every major 'Barbarian' kingdom in the West. Audofleda was a pagan prior to her marriage, and was baptised at the time of her wedding by an Arian bishop. Theoderic and Audofleda had one daughter, Amalasuntha, who was married to Eutharic and had one daughter and one son; Amalasuntha then ruled as Regent/Queen of the Ostrogoths from 526-34. ^ Charles William Previté-Orton The Shorter Cambridge Medieval History. Cambridge: University Press. 1966. 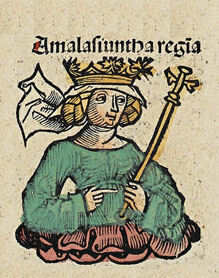 Amalasuntha was a regent of the Ostrogoths during the minority of her son from 526 to 534, and ruling queen regnant from 534 to 535. She was the youngest daughter of Theoderic the Great, and firmly believed in the upholding of Roman virtues and values. She is best known for her diplomatic relationship with Justinian I, who would invade Italy in response to her assassination.